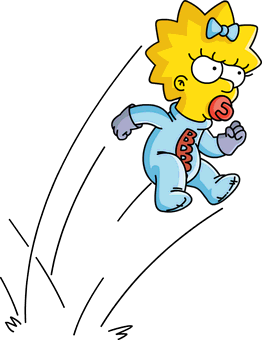 Margaret Evelyn "Maggie" Simpson (born June 16, 1988) is the youngest child of Marge and Homer, and sister to Bart and Lisa. She is often seen sucking on her pacifier and, when she walks, she trips over her clothing and falls on her face. 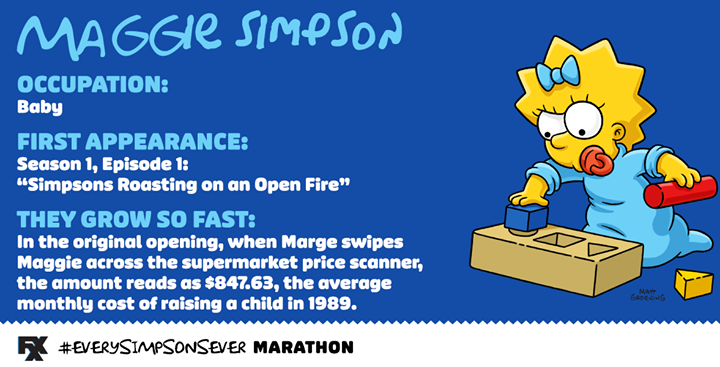 Because she cannot walk or talk, Maggie is the least seen in the Simpson family. When Marge became pregnant with Lisa, she and Homer bought their first home. Seven years later, Homer felt financially secure enough to quit his job at the power plant and take his dream job at Barney's Bowlarama. Soon after, Marge became pregnant with Maggie, and unable to support his family, Homer reapplied for his job at the power plant. 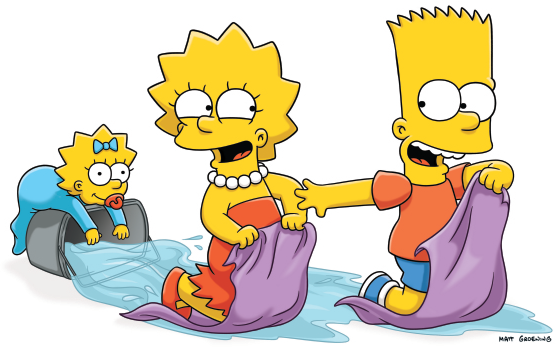 Homer fell into a deep depression but when he held Maggie for the first time after she was born he loved her at first sight. He keeps Maggie's baby photos in his office to cheer him up at work. Maggie is self-absorbed, orally fixated (hence her omnipresent pacifier), and almost always gets her own way. When she doesn't she becomes cholicky and/or throws tantrums, which cause her family to seek to mollify her. Impressionable and easily influenced by what she sees around her, she once hit her father on the head with a mallet, shot a suction dart at his picture, and brandished a pencil (all in imitation of the ultraviolent television show Itchy and Scratchy watched by her siblings and, indeed, all the children in Springfield). She felt guilty over causing the Springfield Prison break, ultimately blamed on Bart, which got him banned from watching the Itchy & Scratchy movie. A formidable markswoman with a rifle, she winged and drove off in rapid succession seven mobsters out to kill her parents. She was also behind the shooting of Mr. Burns, which may or may not have been an accident, when he tried to steal her lollypop and his gun fell out of his pocket and the two scuffled. Maggie fought Gerald, the unibrowed baby (the two babies hate each other very much) during the St. Patrick's Day Riot sparked among tourists to Springfield from the Emerald Isle by a ban on alcohol. She was on the side of those representing Ireland, while Gerald represented Northern Ireland, although neither baby is Irish. When the family's house was being raided by an angry mob, she was able to smash her baby bottle and use it as a makeshift weapon (although only against Krusty's monkey, who promptly ran away). 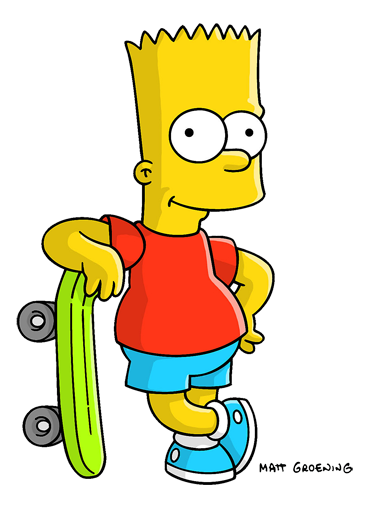 In The Simpsons Movie, she rolled a boulder on the head of Russ Cargill, the evil head of the EPA, when he was about to shoot Homer and Bart. Maggie is often frightened of her father's attempts to bond with her, although she does love him. Instead, Maggie shows a much stronger attraction to her mother instead, possibly because Marge is always at home with her while Homer is mostly at work or at Moe's. She is keenly aware of her surroundings, and can usually be seen imitating the flow of action around her. 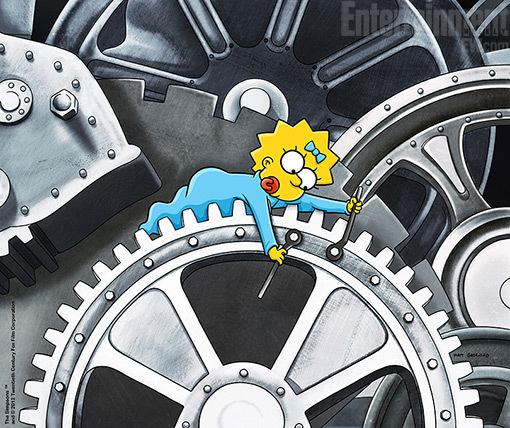 Like Bart, Lisa and Homer, she is not fond of spending time with her aunts Patty and Selma. She bears a strong resemblance to her elder sister, Lisa, suggesting Maggie will look very much like her sister when she reaches eight-years-old. 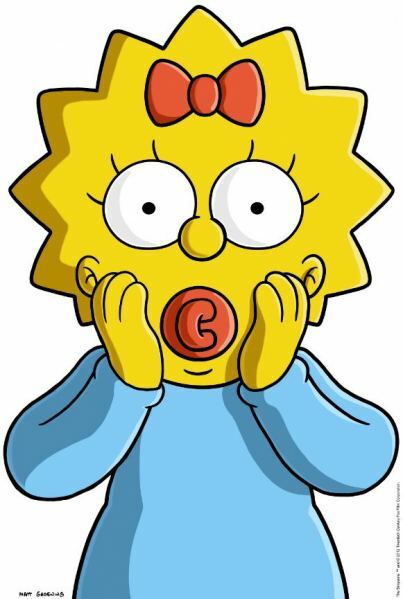 Maggie's first word is "Daddy", something neither Bart or Lisa would call him when they were babies. 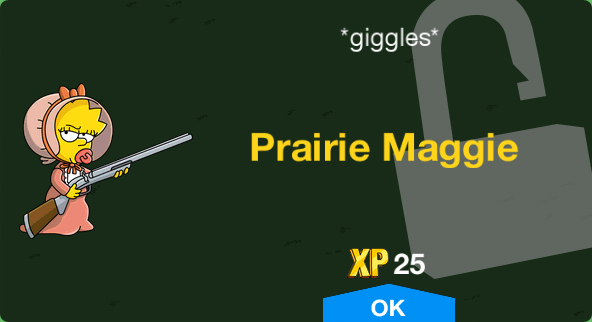 On another occasion, Maggie's speaks the word "Ya"; a Norwegian word. She also said "Dadily Doodily" when she was in the care of Ned Flanders. At age 9 during Bart and Lisa's high school graduation, Maggie visits Alaska, hotter because of global warming. At this age she looks exactly like Lisa does currently but still wears her blue bow. At 16, she dresses in a punk-style fashion. 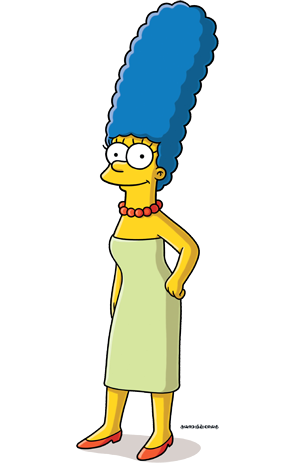 It is said she has a beautiful singing voice and, according to Homer, never shuts up on the phone (ironically, whenever she tries to speak, she is always interrupted). At some point as a young adult she marries Gerald but finds his constant interruptions annoying. It is unknown if the marriage lasted. 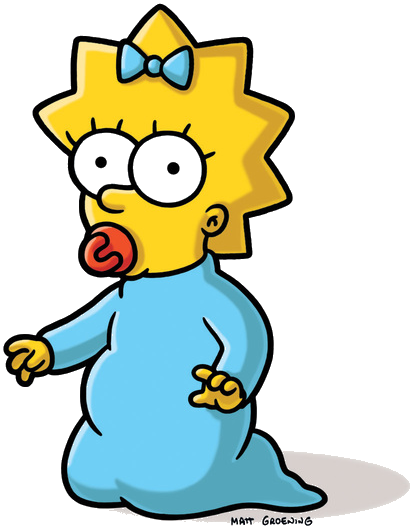 She gives birth to a daughter (Maggie Jr.) who, as a toddler, looks exactly the same as Maggie does now. 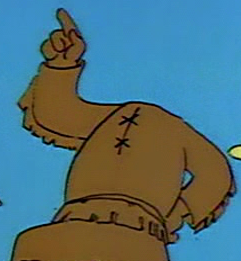 In "Treehouse of Horror V" Homer briefly visits an alternate universe and sees Maggie hit Groundskeeper Willie in the back with an axe. She says in James Earl Jones's voice: "This is indeed a disturbing universe". 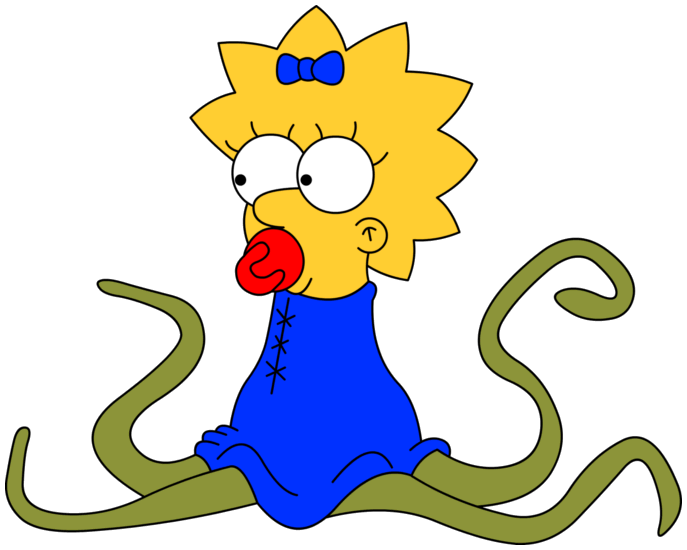 In "Treehouse of Horror VI", Maggie saves Bart and Lisa from Groundskeeper Willie (as a bagpipe spider) in their dream by clogging his pipe with her pacifier. 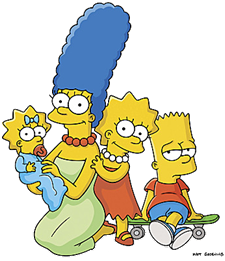 In "Treehouse of Horror IX", Kang is Maggie's real father and was born as the result of Marge being forced to take part in a cross-breeding program. 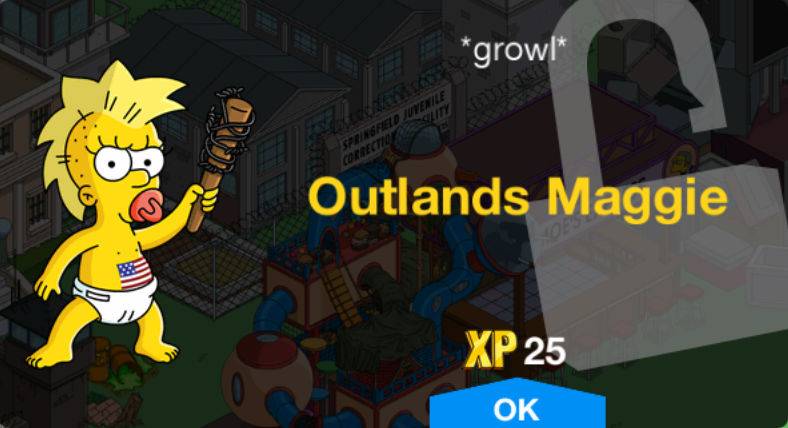 Maggie starts to grow fangs and her arms and legs are replaced by tentacles. Kang attempts to take her with him but instead appears on The Jerry Springer Show with Homer during which Maggie attacks and kills Springer. 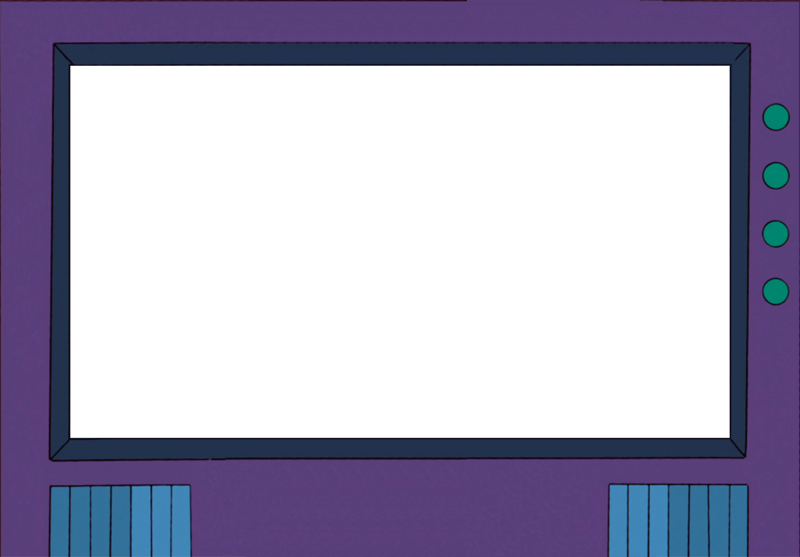 At the end the Simpsons manage to keep Maggie but she begins asking for blood in Kang's voice. 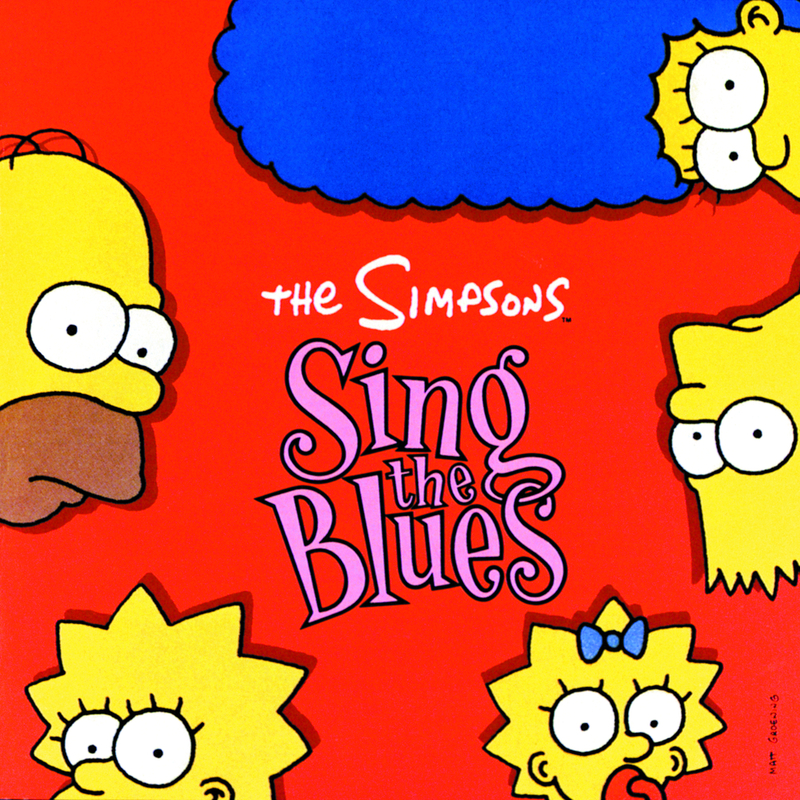 Matt Groening first conceived the Simpson family in the lobby of James L. Brooks' office. 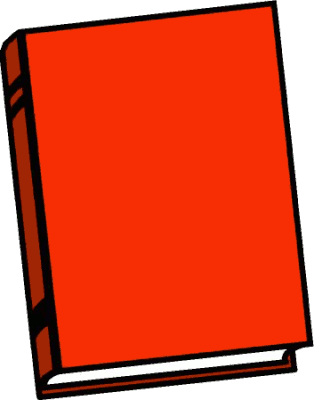 He had been called in to pitch a series of animated shorts, and intended to present his Life in Hell series. When he realized animating Life in Hell would require him to rescind publication rights for his life's work, Groening decided to go in another direction. He hurriedly sketched out his version of a dysfunctional family, and named the characters after various members of his own family. 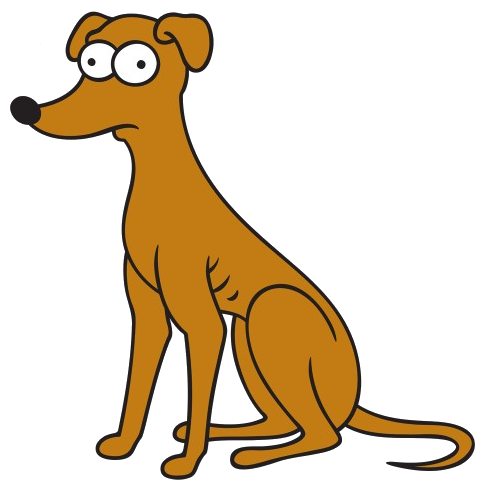 Maggie was named after Matt Groening's younger sister Margaret "Maggie" Groening. 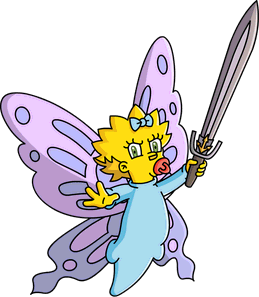 She often sucked on a pacifier and wore a sleep suit, two traits Groening used for Maggie. 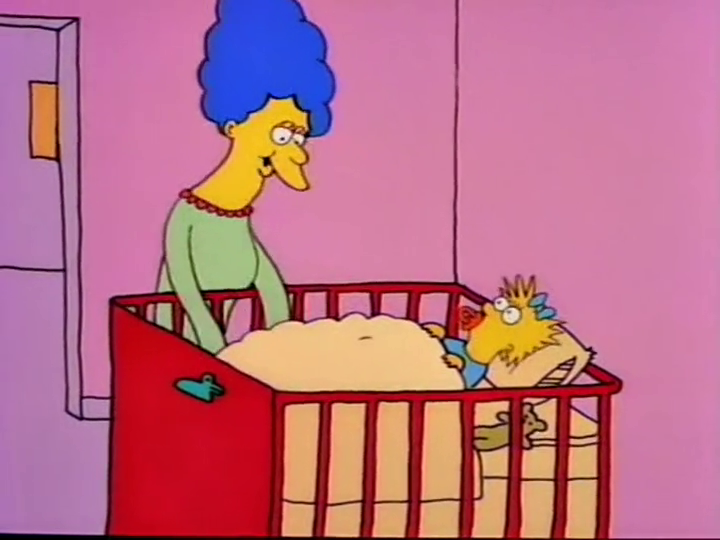 Maggie made her debut with the rest of the Simpsons clan on April 19, 1987 in the Tracey Ullman short "Good Night". 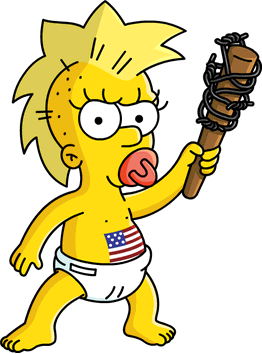 Groening thought it would be funny to have a baby character who did not talk and never grew up, but assigned any emotions the scene required. 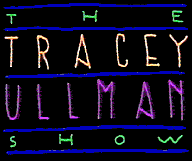 Her comedic hallmarks include her tendency to stumble and land on her face while attempting to walk (though this has been downplayed in later seasons), and a penchant for sucking on her pacifier, the sound of which became the equivalent of her catchphrase and was originally created by Groening during the Tracey Ullman period, and by Nancy Cartwright during the regular series. 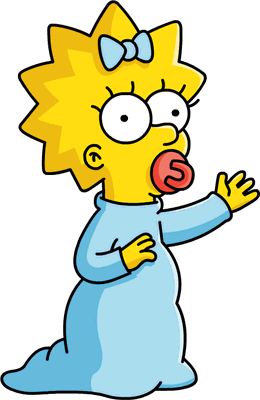 Maggie's first word spoken in the normal continuity of the series occurred in "Lisa's First Word", when she was voiced by Elizabeth Taylor. Elizabeth Taylor's performance as Maggie was named the 13th greatest guest spot in the history of the show by IGN. 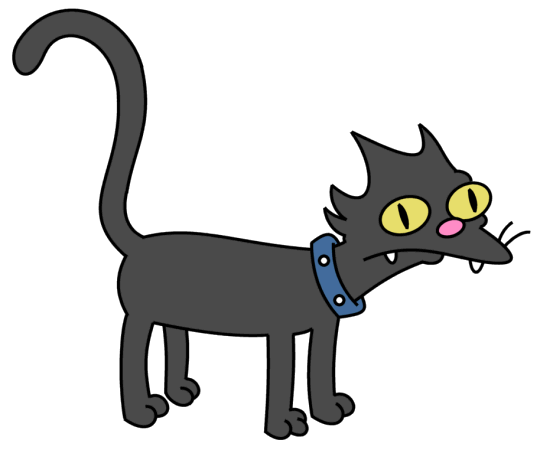 James Earl Jones, who voiced Maggie in "Treehouse of Horror V" was in seventh place. 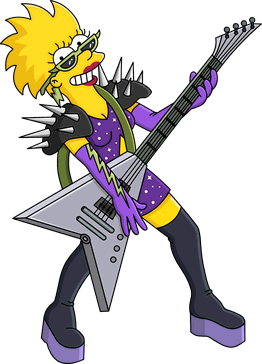 She would later have brief dialogue in "Treehouse of Horror IX", voiced by Harry Shearer, who used his Kang voice. Although she spoke many times, she only had two canonical speeches real within the series. 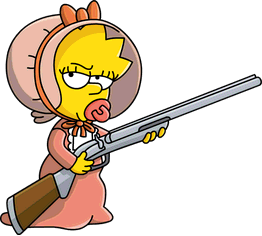 Her first canon speech was in "Lisa's First Word", and this word was "daddy", however only the viewers and not the family heard her say this (At least until the Father's day Clip show). This was done by Elizabeth Taylor. Her second speech was in "Coming to Homerica". This time the family did hear her speak. Maggie has saved people's lives on a few occasions, almost always members of her family. 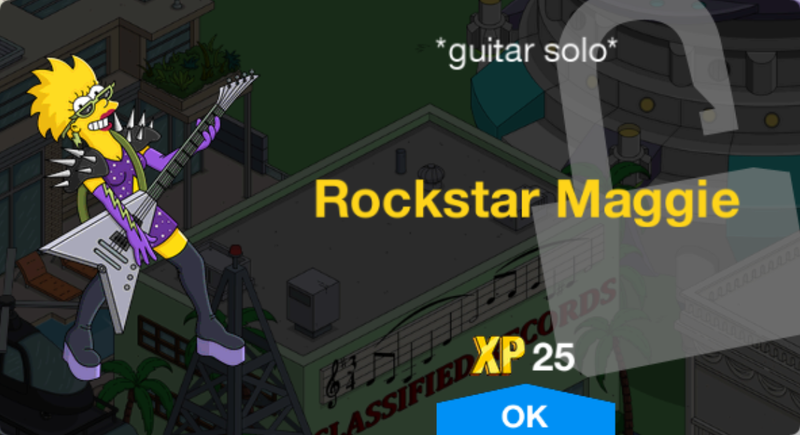 She saved Bart and Lisa from Groundskeeper Willie in Treehouse of Horror VI and she saves Homer from being killed by gangsters by winging them with a shotgun in Poppa's Got a Brand New Badge. 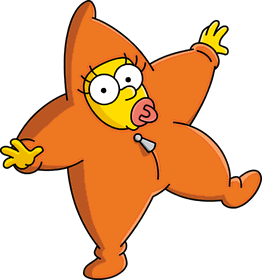 She even rescued her nemesis, Gerald, from floating into space in Maggie Simpson: Bringing Down Baby. 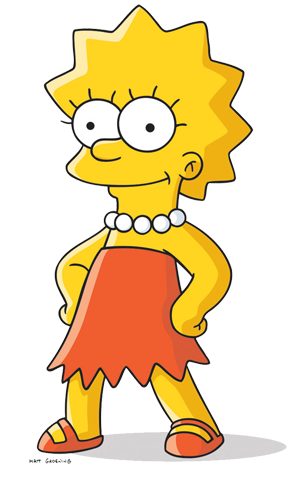 She saved her father a second time on The Simpsons Movie from Russ Cargill by rolling a boulder down on his before he could kill Homer. In Hello Gutter, Hello Fadder, she saved him from drowning. 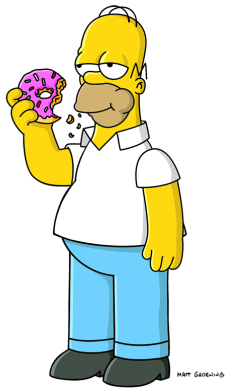 (In realization, Homer once said, "What a great little accident you turned out to be", referring to the fact that her conception was unintended). ↑ 10.0 10.1 "Who Shot Mr. Burns? 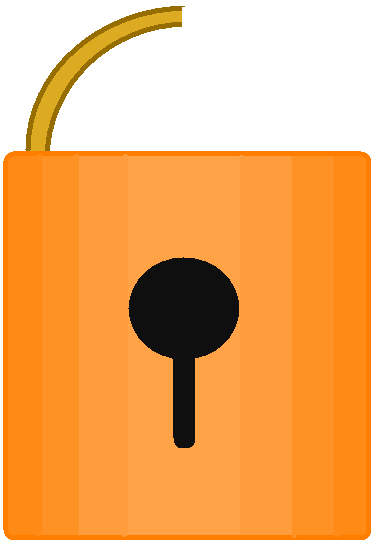 (Part Two)"
Modified on April 19, 2019, at 07:34.